I’ve seen this one around for months — it has been on the New York Times Bestselling list, after all; and that’s not mentioning all the blogs I’ve seen it at — but for some reason, I’ve just never felt compelled to read it before now. Perhaps it’s because I figured it was one of the “those books”, feel-good stories about kids with disabilities that are supposed to enlighten me while making me somehow grateful I don’t have to go through that. And in many ways it was that book. August is an ordinary kid in many ways: he likes Star Wars, he enjoys reading and hanging out with his friends. Sure, he’s been home schooled, but that’s because he’s had so many surgeries that going to school wouldn’t have been practical. See, he has a condition that isn’t one of those you can hide: it affects his face. So, first impressions are not good. But, now he’s starting fifth grade, and in addition to all the ups and downs, conflicts and highlights that go with fifth grade, August has to deal with a whole new set of people seeing his face, and judging him before they even get a chance to know him. Of course, there will be kids (and parents) who can’t get past August’s facial anomalies. Of course, there will be bullies and problems and Things To Overcome. And, of course, August will Rise Above It All. But — and this surprised me — it was also not that book. There was a matter of fact-ness to this book that helped surpass the whole agenda for me. August was clearly an amazing kid, not because he’s special but because he’s not. He faces the world as any other ten-year-old boy would, and it’s everyone else — from his parents to his sister to his friends — who endow him with difference. I appreciated having the book from August’s point of view, but I also liked the chapters where we got to see him through different eyes (for the most part; there were a couple of times when I wondered why Palacio chose a specific character to move the story along). It was in doing this that Palacio got her main point across: that we are all people, no matter what we look like. As an interesting side note: A picked up this other book the other day, and even though it’s not usually what she reads, she began reading this. There’s a friend of hers at school who is like August (though it’s his hands and arms, not his face), and she was interested in the idea that something like what her friend has would make a good book. I’m looking forward to talking to her about it when she finishes. 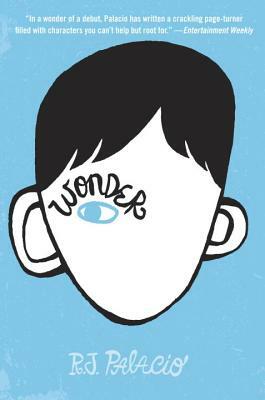 And, perhaps, that’s the best thing that can be said about Wonder: it will inspire conversation and discussion among those who read it. This was one of my favorite books of the year (although I agree with you about the boyfriend chapter!). Please let us know what your daughter thinks about it, I'm curious. I always struggle with changes in point of view, but it was used to good effect in this book. This has circulated slowly and steadily, mainly thanks to a teacher who read and keeps recommending it, and would certainly be great for our 8th grade unit on Challenges. I have heard great things about this book and I appreciate you writing out such great details. It is one I will check out for sure.